Recently I recreated an amazing toasted sub, or grinder, from Brevins restaurant in Churubusco, Indiana. After making the sandwich I had salami, pepperoni and ceaser dressing left over. I thought about getting more ham and french bread for another grinder but I did what any man would do - pile them on a cheeseburger! I decided to add a layer of basil and the end result was what I call - The Meaty Italian Burger. It’s a bit heavy and not for the weak at heart (or people with cholesterol problems) but, to say the least, it’s an all-star man bite. I’m half tempted to call Carl Jr's. to see if they’ll try it as one of their six dollar man burgers. I would love to see a voluptuous super model chowing on this in something skimpy in one of their controversial commercials. 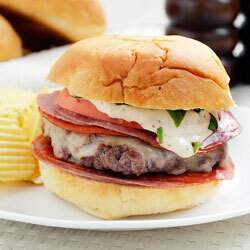 The ceasar dressing adds a ton of flavor and compliments the deli meats that adorn the thick burger patty. I could have went with pizza sauce and made this more of a meat lovers pizza burger but I’m glad I went the went this route, I'll try the pizza burger another day. I made these in the afternoon and later in the day I had to watch my nephews. 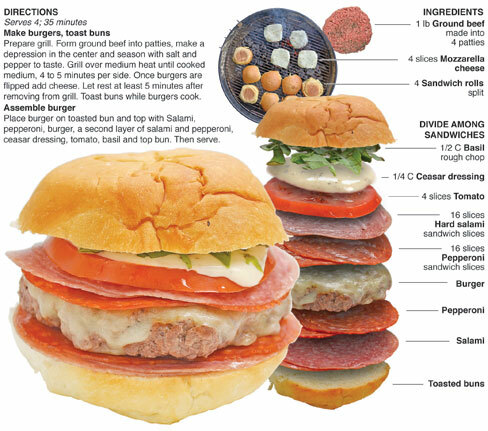 I made four burgers but I had only enough salami and pepperoni for two. I ate the first one and thought I would give the second to my nephews to split. Once they arrived the two played for a while and then it was time to warm the burgers so they could snack. 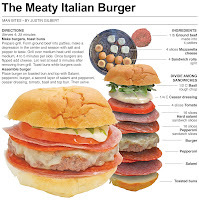 Like a stingy over-eater I grabbed the Meaty Italian burger for myself and left the plain burgers for the boys. I wasn’t really hungry, it's just that I had to have it. The burger was really tasty and I just couldn’t resist. I must have looked like Gollum from the Lord of the Rings. I gobbled up the burger as if I hadn't eaten weeks. They didn’t care though. A burger is a burger is a chicken nugget to those guys. Some kids may appreciate fine cooking by my nephews usually want the special sauce left off or anything else added to make the meal gourmet – typical kids I guess. Justin, such a great graphic - it must take you ages to do them. Fantastic link for Food on Friday thank you.